Feb. 2, 2011 5:00 p.m.
Photo: With the February 28 deadline approaching for area livestock producers to insure hay and pasture this year, Chris Dyck, with AFSC, says things look a whole lot better than they did at this time last year. He notes provincial weather maps (shown here) illustrate that the extreme swing in soil moisture many farmers experienced last year – from very dry to suddenly quite wet – is not uncommon in Alberta. With the February 28 deadline just weeks away for area livestock producers to insure pasture and hay land this year, the dramatic turn around in soil moisture that surprised farmers across much of Alberta last spring has many wondering what kind of growing season lies ahead in 2011. 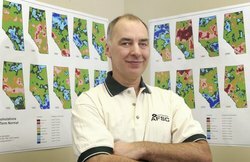 “At the moment, most of the province isn’t looking too badly for soil moisture going into the spring except for the Peace region which is still quite dry and a few other pockets around the province,” says Ralph Wright, soil moisture specialist with Alberta Agriculture and Rural Development (ARD). “Looking at precipitation accumulations over the last year compared to long-term normals, the Counties of Wetaskiwin and Leduc are generally at least near normal ranging to high in the central part of Wetaskiwin County,” says Wright. Things look a whole lot better than they did at this time last year when most of the province was extremely dry and the situation appeared grim for many farmers, he says, noting April and May marked the turning point as the rain began to fall and it quickly became wet in many regions. What the coming spring might bring is anybody’s guess, he says. “What we do know is that extreme swing in moisture that transformed the province last year – from very dry to suddenly quite wet – is not uncommon. If you look back at weather maps over the last 50 years, you’ll find countless examples of similar swings in various parts of the province from year to year,” he points out, referring to the province’s AgroClimatic Information Service at www.agric.gov.ab.ca/acis. Hay and pasture insurance is one option livestock producers should consider before the February deadline arrives, but there are a few other critical factors they also need to think about this year, says Grant Lastiwka, a provincial forage specialist with ARD. “While many cattle producers had amazing growth on their pastures and hay crops last year thanks to all the rain, a lot of these forage stands aren’t what they used to be,” says Lastiwka. “In many cases, they’ve evolved to older hay stands that have lost their deep-rooted legumes, and older pastures that have lost their deep-rooted grasses. They’re now dominated by grasses – often shallow-rooted and less drought-tolerant – which can result in lower yields.” He says largely to blame are drought conditions in 2009, overgrazing, and tight cash flows in a struggling industry that have hindered producers from fertilizing or seeding new stands as regularly as they should. These older pasture and hay stands will be more dependent than ever on producers’ management practices, fertility programs, and plenty of moisture throughout the upcoming growing season, says Lastiwka. “This spring, producers should consider reseeding hay and pastures back into deeper-rooted legumes and grasses that are better able to withstand drought.” He adds producers need to focus more on managing their pastures for greater plant health by not grazing too early in the spring, which reduces yields by preventing root systems from recovering fully from the winter and from any lingering damage caused by drought conditions in 2009. Gordeyko fertilizes each spring and reseeded some hay last year to keep his stands healthy. “Of course, you can do all the management you want, but if you don’t get some good moisture and heat in the spring, nothing will grow very well,” he says, explaining that uncertainty is the main reason he’s insuring his hay and pasture again this year. Last year, more than $6 million was paid on hay and pasture claims in Alberta – mainly due to lack of moisture in the Peace region, says Chris Dyck, Senior Manager of Insurance Operations with Agriculture Financial Services Corporation (AFSC), the provincial Crown Corporation that administers crop insurance in Alberta. Across the province, claims were also triggered by a cool, dry spring that delayed forage growth by up to a month in some areas, as well as flooding, frost, and hail. New to Perennial Insurance this year is the addition of thirteen weather stations to AFSC’s provincial network, bringing the total to 196. “We try to add new stations every year, strategically locating them to reduce the distance between the stations and producers’ land bases,” he explains. He adds that while Perennial Insurance helps livestock producers across Alberta manage their feed risk when pasture and hay crops fail, a growing number of those individuals in the beef industry are also now using the new Cattle Price Insurance Program (CPIP) for feeder cattle, launched in November to help protect them against price risk on their herds. “It gives them one more tool to help manage risk in a challenging industry. CPIP-Feeder lets them insure an Alberta ‘floor price’ on their cattle – based on forecasted, market-driven prices – while still allowing them to sell those animals at the highest possible price,” he explains. CPIP-Feeder is a voluntary program that is available year round. It is designed for Alberta beef producers who background cattle to about 750-to-950 pounds. Lastiwka says interest in the new program coincides with a growing trend among cow-calf producers to calve later, keep their calves longer, and sell them at heavier weights into different markets. “By calving later, extending their grazing season into winter, and keeping calves over winter to go to grass as yearlings the following spring, producers are trying to create a larger saleable product at a lower cost for greater profitability in today’s high cost world,” he explains. For more details about the Cattle Price Insurance Program or Perennial Insurance for hay and pasture, producers can contact their nearest AFSC office or phone the AFSC Call Centre at 1-877-899-2372 before the February 28 Perennial Insurance deadline.